Client pays for my fuel and the amount is agreed before my departure. I provide a free service and any donation to the Margaret Green Animal Rescue Centres made directly from the client to them. All land and water up to 5' deep. I have been detecting for several years now and use state of the art equipment. As a side line to my hobby I like to search for lost property for the sole purpose of reuniting people with their lost property and raising money for charity. I can’t recommend and thank Richard enough. 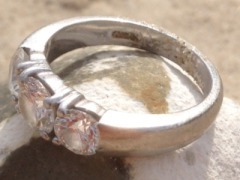 To trust us with his equipment to enable me to find this precious ring was so lovely of him. We had the help of some lovely people at the New Forest Show as well Lucy and her mum who parked next to us and another lady called Jo spent 2 hours on our hands and knees helping find 5 of my rings and Hannah and her Police Cadets from the show ground also helped. To loose my Nan’s wedding ring after having it since she gave it to me just before she died 36 years ago would have been devastating so a big thank you again to Richard and everyone involved. On Monday, 23rd July, 2018, my wife, three children and I spent a delightful day on Swanage beach. Having had a swim, I was drying myself off when I felt through my towel my wedding ring slide off my wet finger. I immediately told the whole family to freeze and gingerly began to run my finger through the soft dry sand. The sand on Swanage beach must be among the finest in the country. 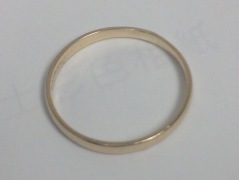 It is so soft that the ring simply “vanished”. After a fruitless twenty-minute search, I decided the best thing to do was to find an ironmonger’s and buy a garden riddle or builders’ sieve … and shovel. 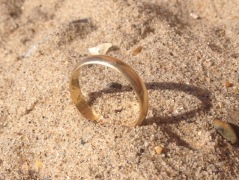 I sifted sand looking for my ring for nearly two hours. I cleared a 3- by 4-metre rectangle of soft, dry, surface sand – about the amount shifted by a medium-sized JCB bucket! – to no avail. At 6.15pm I called off the pointless search and left Swanage. A kindly RNLI lifeguard (Peter), who had been following my plight, had mentioned a Facebook page which was dedicated to helping people find their lost possessions. From the FB page I quickly located TheRingFinders.com website and was told that Richard Higham was the local searcher, nay, finder, of rings. After a sleepless night, at 5.52am I sent an email to Richard. I described what had happened and attached a Google Earth plan of the area in which I thought the ring must be lying. At 8.50am I called Richard; he was reading my email message. He said he couldn’t lose time and had to get to the beach. There was a hasty goodbye and I rang off. At 9.08am, just a quarter of an hour later given the length of the initial phone call, Richard rang me: he had found the wedding ring! Amazing! On Tuesday morning I drove down to Swanage to meet up with Richard. It was here that I discovered what kind of kind person Richard is: I offered a reward, compensation for his time, effort, experience, expertise and kindness … only to be told he didn’t expect reimbursement or payment! He wouldn’t even accept a beer! 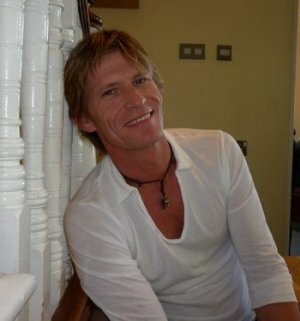 The agreement with Richard on the finding of a lost article is a donation to a charity of his choice. As soon as I receive details of which charity he has chosen, a figure will be flying to its bank account. A truly remarkable experience with a very, very happy ending. 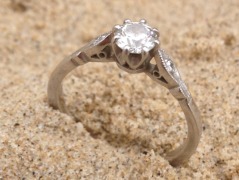 We can’t thank Richard enough for coming all the way from Swanage to find my engagement ring for us. I was absolutely devastated when it had slipped from my hand and we were unable to see it anywhere. I am so unbelievably grateful that Richard gave up his time to come and search for it for me. He is an amazingly generous person, both with his time and the fact the only payment he wanted was a donation to charity which we gladly made. Thank you so much! Thank You Richard – MY SAVIOUR! Amidst the moment when i was feeling hopeless, useless, devastated i found this saviour who was so spontaneous that he reached the desired venue within 2 hours with all the equipments. He didn’t show any hesitation to jump into the cold water and look for the ring.. He kept us optimistic and we just believed in him and YES HE FOUND IT!!!! Without him I would be still living with a deep regret.. A man i would never forget in my life and will always be grateful for.. Thank you Richard, God bless you & Will see you at my wedding! Thank you again for your help on Saturday. I will donate £50 plus gift aid to the Dorset air ambulance today. For your blog, the story is that we were just spending a family day at the beach and I took the ring off to suncream my boy. I've done it a thousand times because I don't like the cream getting in between the rocks. 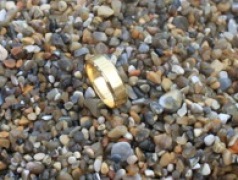 Popped the ring in my pocket then got all rushed into changing to get into the sea and that was when the ring flew out into the sand. It was our 12th wedding anniversary the following day so it was going to be super sad if I lost it. I can't thank you enough and am so impressed that you were able to come down that same day and put me out of my misery. Wishing you all the very best with your ring finding in the future.